Among these pioneers were young men and women who would come to study art in Paris, including George P. Healy, John Singer Sargent, Mary Cassatt and Augustus St. Gaudens. First Mary Cassatt. Because I love her story. Cassatt was from a proper and prosperous Pennsylvania family who could afford to travel through Europe. After studying art in Philadelphia, she told her father that she wanted to study art abroad. He tried to discourage her (“I’d almost rather see you dead than become an artist!”) but he gave in like dads are known to do. 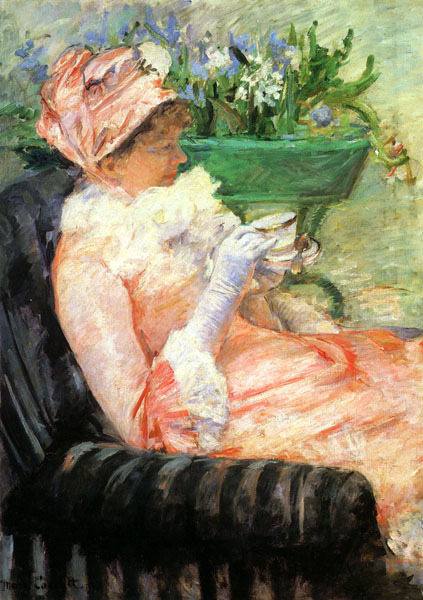 Cassatt would decide to live in Paris in 1874, and thereafter make France her home for the rest of her life. 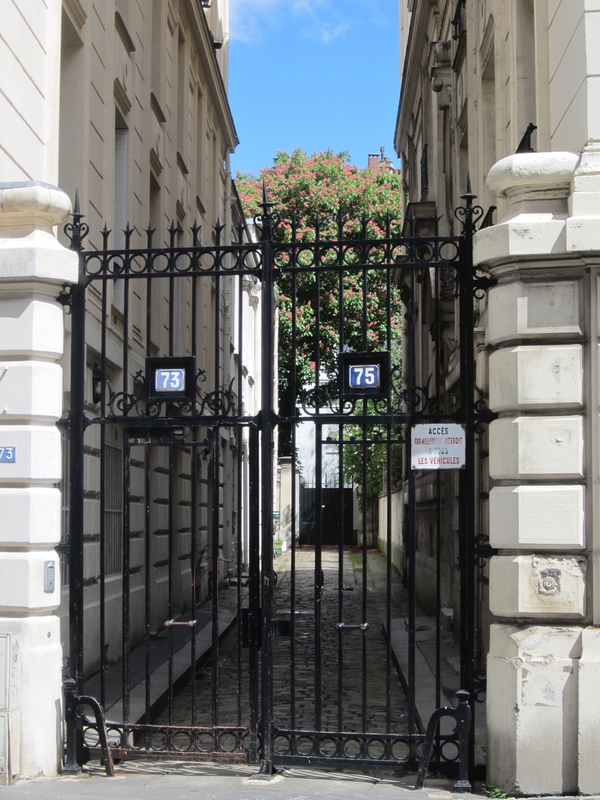 Mary and her older sister Lydia moved into a small apartment on rue de Laval (now Victor Massé). It was a street known for artist’s homes and studios. 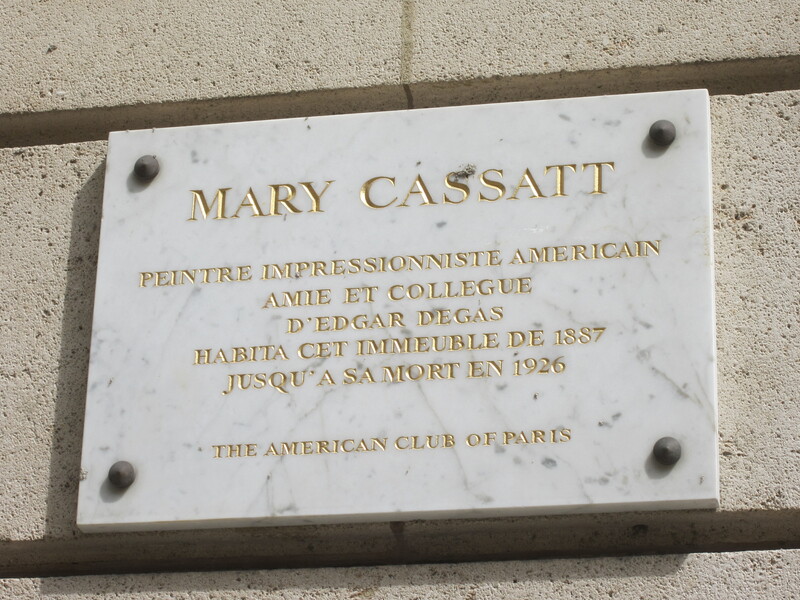 Cassatt would become close friends with Degas (who lived and worked on rue Victor Massé for many years), discovering his pastels in a gallery window on nearby boulevard Haussman. In 1878, Cassatt’s parents decided to come live in Paris, and together they moved to a larger apartment at 13 avenue Trudaine, in the respectable streets at the foot of Montmartre. There, Cassatt could be close enough to walk to her and her friends’ art studios, but yet far enough away to be proper. They had a beautiful view of Sacré Couer from their fifth floor apartment. 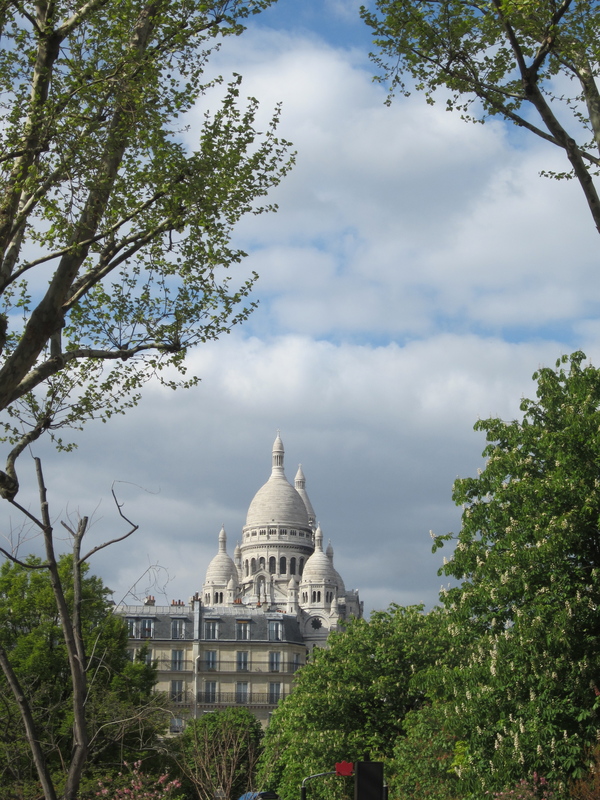 The view of Sacré Couer from the park across the street from Cassatt’s avenue Trudaine apartment. Finally I could work with absolute independence without concern for the eventual opinion of the jury. . . . I detested conventional art and I began to live. Once her parents moved to Paris, Cassatt turned her focus toward domestic family portraits of her mother, sister, nieces and nephews. Her portraits would not be highly flattering society portraits, but rather, beautiful studies in composition and mood. Her women would be introspective and intellectual, utterly without pretense, often concentrating on a task, a newspaper or a book. In Cassatt’s 1878 portrait of her mother, Cassatt builds an intriguingly complex composition through the use of a mirror on the left half of the canvas that emphasizes the act of reading. 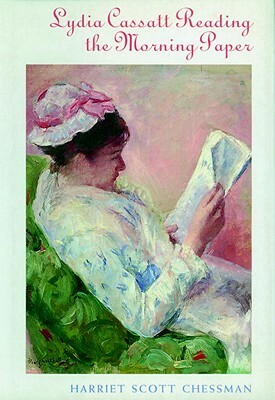 Mary Cassatt, Reading Le Figaro (Portrait of Cassatt’s Mother) 1878. Displayed in Fourth Impressionist Exhibit in 1879. Cassatt may suffer from a modern feminist bias against highly domestic scenes with women and children, as if Cassatt agreed that this was the only proper sphere for women. In fact, Cassatt was a highly ambitious artist who never married and who was responsible for earning her own living. Cassatt’s tough-love-count-every-penny father demanded that she pay for her own studios and art supplies from the sale of her work. She did. Cassatt was not highly social, and unlike the male Impressionists, she could not properly hang out at the cafés and nightclubs of Montmartre. However, she did enjoy going to the opera about four times a week in the company of close friends and family. Here she would be able to sketch out a fascinating series of paintings. 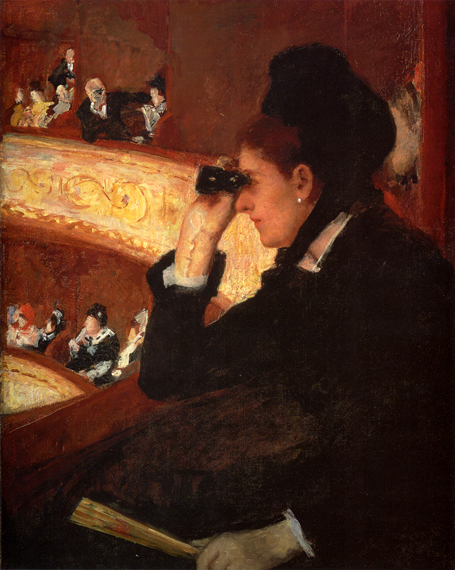 While the painting of Cassatt’s sister Lydia in the evening dress might be more traditionally pretty, it is her pose in a black dress at a matinée that is more interesting, and seems to have the more to say. In fact, if you have a couple extra minutes, you should really listen to this “Smart Art History” video about Cassat, the Paris Opera and the painting below. By the late 1880s, Cassatt was finding her own success and beginning to sell many of her paintings. 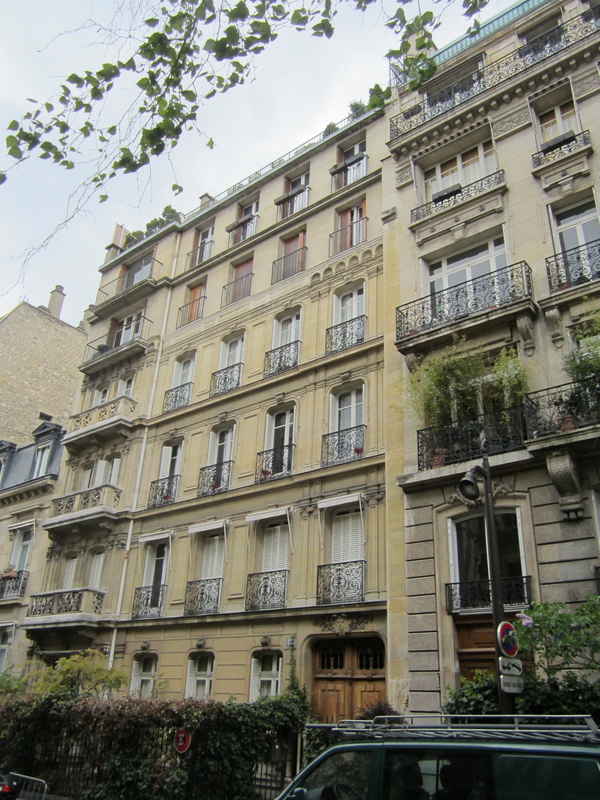 She and her family would find a larger apartment in an even nicer part of Paris at 10 avenue Marignan near the Champs-Élysées by 1887. Cassatt would keep this apartment for the rest of her life, although she and her family would rent numerous summer homes in the suburbs of Paris. 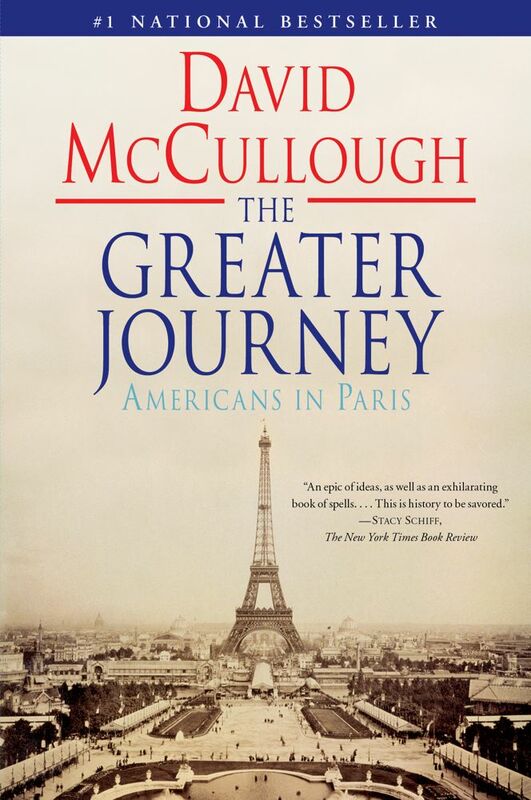 The Greater Journey by David McCullough: Highly recommended. 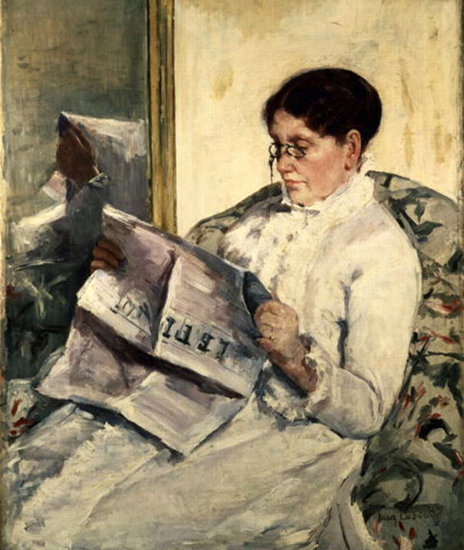 Also recommended, Lydia Cassatt Reading the Morning Paper by Harriet Scott Chessman. May 8th is a National Holiday in France in honor of Victory in Europe Day, the day the Allies accepted the unconditional surrender of Nazi Germany in World War II. It brings to mind all of the good literature, both fiction and nonfiction, that has been written about this time period in Paris. Just a few recommendations to share with you. Americans In Paris: Life and Death Under Nazi Occupation by Charles Glass is an excellent and highly readable account of the Americans who stayed behind after France declared war on Germany, and even after the United States entered the war. Just like the French who stayed in Paris, many of the Americans who stayed lived in the grey area between resistance, collaboration and survival. Except of course, Sylvia Beach, the owner of the original Shakespeare & Co. She stood her ground and refused to sell the last copy of Finnegan’s Wake to a German soldier, insisting on saving it for an English-speaking customer. 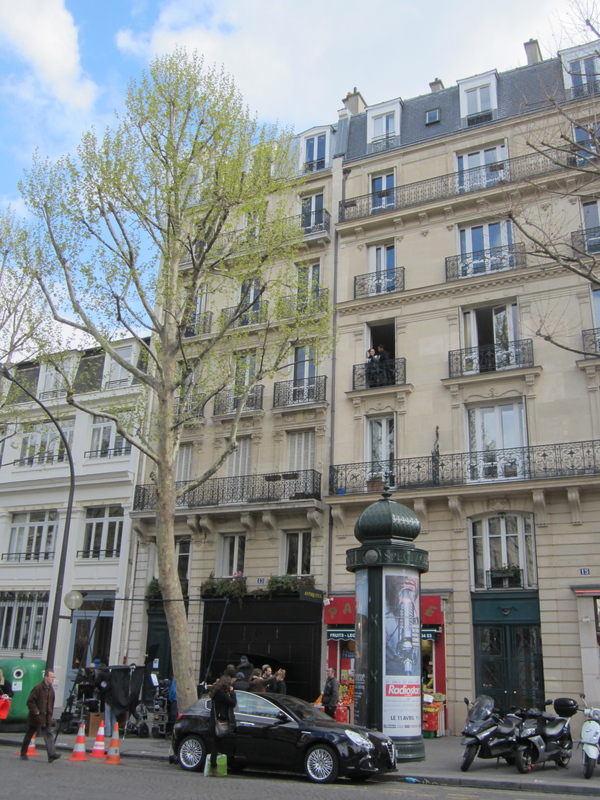 Beach knew she had infuriated the German officer, so within hours, she packed up all of the books in the bookshop and moved them a few doors down to her apartment on rue Odéon. She never re-opened her shop again. Another excellent nonfiction account of the Occupation era is And The Show Went On: Cultural Life in Nazi-Occupied Paris by Alan Riding. A thoroughly researched book, this one focuses on the ways that the Parisian culture – from the opera and the nightclubs – continued to thrive under the Nazis, although with considerable censorship and control. Sylvia Beach again merits attention, as does the Rose Valland, the surprising heroine of the Jeu de Paume who kept meticulous records of the artwork plundered by Hitler, Goring and their associates, so that it could be tracked down after the war. Again, there are the complicated issues of collaboration and resistance, which Americans seem to find so difficult to comprehend. Fascinating. I am also recommending a book that it completely new to me; in fact, I have just ordered it thanks to the folks at Paris Walks, who read a powerful excerpt during my recent Left Bank During The Occupation tour. It is called The Journal of Helene Berr, and it sounds like Diary of Anne Frank, except written by a mature, college-educated Parisian. Like Anne Frank, she was Jewish, she was deported and she was killed just before the war was over, but her diary has survived. Although this book was originally published in French, it is also available in English. 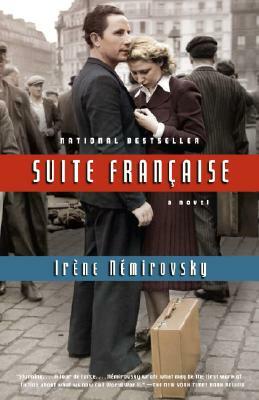 Finally, I must mention Suite Française by Irene Nemirovsky. It has received many well-deserved accolades, and was very well received by many book clubs when it was released, so it should be no surprise. But if you haven’t read it, I urge you to read it now. This is powerful fiction. Much of it is based on Nemirovsky’s own experiences as a Jewish woman who escaped Paris with her family to live out most of the war in Issy-l’Évêque, a small town in Burgundy. Like Helene Berr, Nemirovsky was eventually deported and killed, but her daughters kept her manuscripts hidden in a suitcase. I really, really loved this book. In previous posts I have written about two other World War II era works of fiction set in Paris: Sarah’s Key by Tatiana de Rosnay, and Pictures at an Exhibition by Sara Hoghtelling. Check out my earlier posts for a photo tour of some of the scenes from these books. I would love to hear any World War II era books you might recommend, especially those set in France. 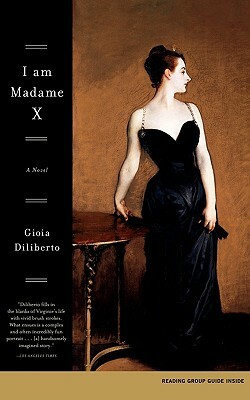 I first read Gioia Diliberto’s I Am Madame X back in 2004. I might have even picked it as a book club read. It’s a fabulous Belle Epoque novel about the life and times of the celebrated 19th century American portrait artist John Singer Sargent and his most infamous model, American beauty Virginie Gautreau. I read it again recently, because John Singer Sargent’s name keeps popping up on my travels through Paris art history. This book is even better the second time around, especially now that I know my way around Paris and I can really appreciate what it meant to be a Left Bank artist versus a Right Bank Artist. John Singer Sargent had the best of both worlds. He was the son of a wealthy, cosmopolitan American family that had lived abroad for decades by the time they arrived in Paris in 1874. 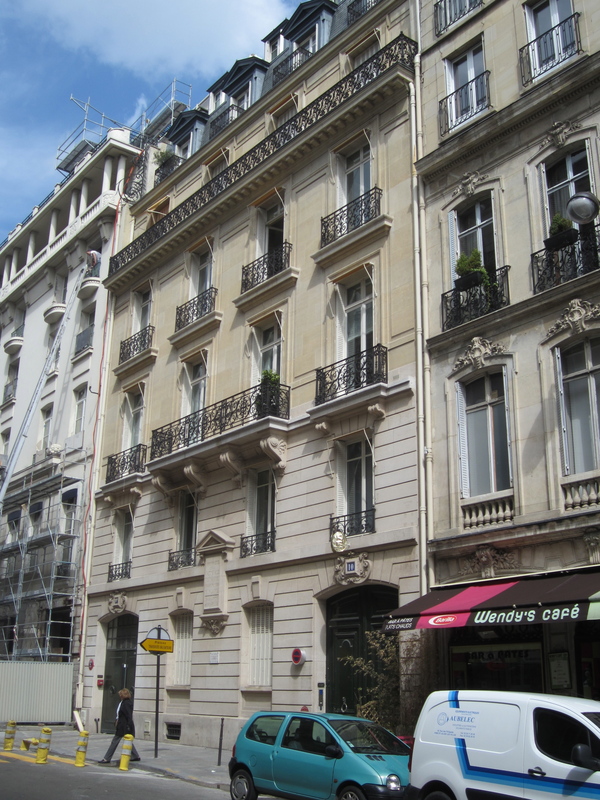 They settled into a posh Right Bank apartment near the Champs-Élysées, which has since become a commercial building at 52 rue La Boétie. Sargent’s father took him to meet the young teaching master Carolus-Duran, who ran a popular Left Bank painting atelier in the heart of Montparnasse. Sargent was only 18 years old, but he was already bursting with talent. He quickly earned the admiration of his fellow students and within a year was accepted at the rigorous L’Ecole des Beaux Arts. 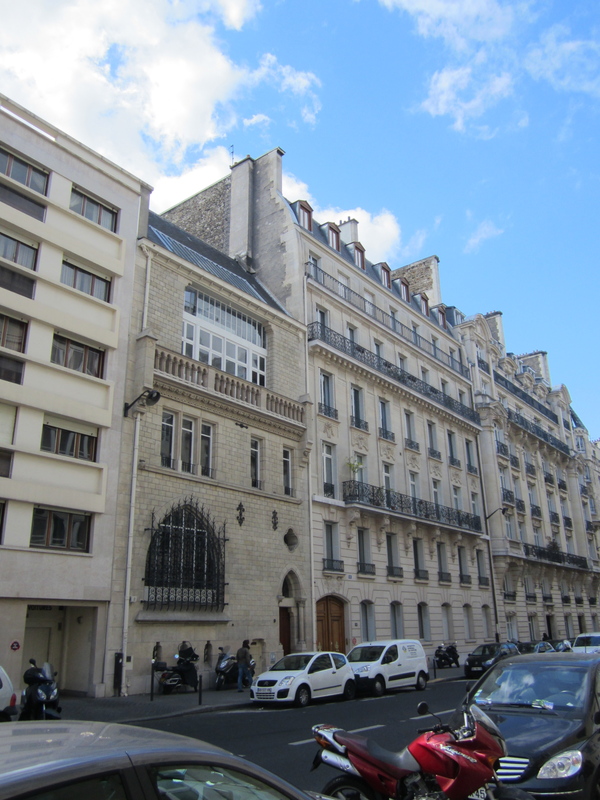 In 1875, Sargent moved out of the family’s home and into a fifth-floor studio apartment at 73 rue Notre-Dame-des-Champs with fellow art student James Carroll Beckwith. The young American artists had found a promising location. 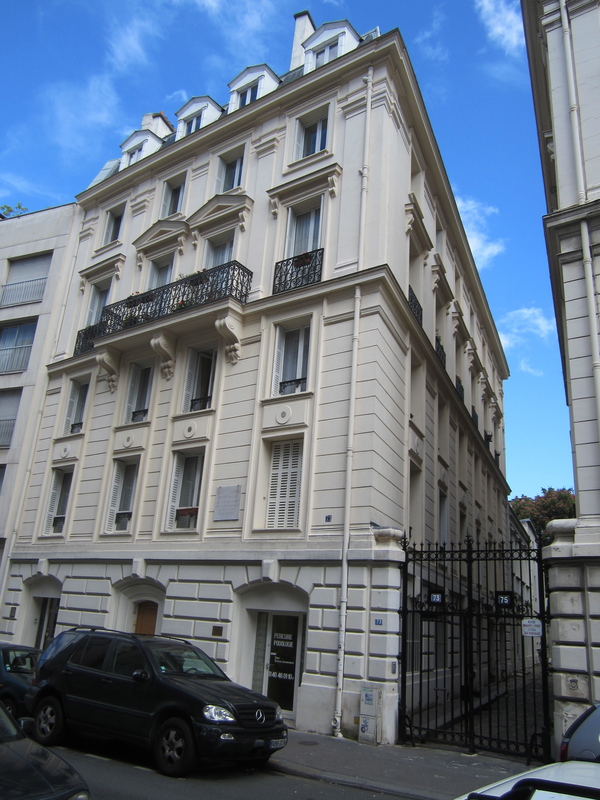 The studios at 73 rue Notre-Dame-des-Champs had also housed the famous French painter Jean-Paul Laurens, while 75 was the mansion-atelier of Adolphe William Bourguereau. By the 1860s, this small, winding road had already been nicknamed “the royal road of painting.” Even today, the address looks inspiring. It still has an impressive entrance and an inviting green courtyard. 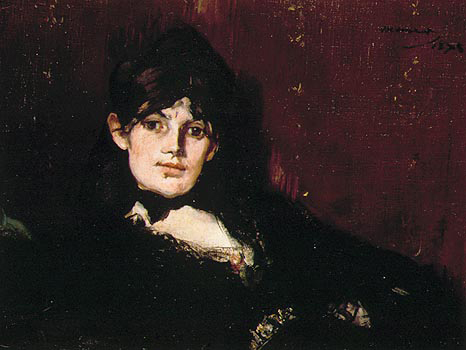 Sargent, Beckwith and their pals led a young bohemian life in the Left Bank. They worked hard but still had time for wild evenings, moving the easels aside for dancing and drinking right in the studio. Sargent was known for entertaining his guests on a rented piano. On Sunday nights, they would clean themselves up for a proper dinner party at Sargent’s family’s home with “educated and agreeable” conversation. In 1879, Sargent painted the portrait of his art teacher Carolus-Duran, and it absolutely launched his career. It was bold, theatrical, and presented a stunning likeness in both spirit and physicality. Sargent was only 23 years old and already one of the best portrait artists in France. On an easel near the French doors stood Sargent’s painting of Dr. Pozzi. It looked like a portrait of the devil. Virtually the entire canvas was red – the sumptuous curtains in the background, the carpeted floor. The doctor himself was dressed in red slippers and the red wool dressing gown that I had seen him wear dozens of times. His pose was hypertheatrical; his face was caught in an intense observance of an object outside the canvas, and his elongated fingers tugged nervously at his collar and the drawstring of his robe. His fingers were as sharp as pincers and seemed spotted with blood. Had Pozzi just performed a gynecological operation? Deflowered a virgin? I just love how Diliberto gave Gautreau such a blunt and penetrating voice. She is clearly no innocent about men, or for that matter, about Sargent’s ability to portray a model’s true character. Sargent was determined to get the chance to paint Gautreau’s portrait. He obviously understood the PR value of painting the “professional beauty” who was the focus of such much attention and gossip in the affluent social circles of Paris. Gautreau thought about giving her business to other more traditional French portrait artists, but she may have felt a special connection to Sargent. They were both up-and-coming Americans with something to prove to the French. In the meantime, steady commissions enabled Sargent to buy a large, new home and studio on the Right Bank, closer to all of his wealthy patrons. In the winter of 1883-84, Sargent moved to 41 boulevard Berthier, on the shaded side of a wide street whose light made it a popular location for art studios. It wasn’t far from the new mansions near Parc Monceau, and in fact just a few blocks from Madame Gautreau who lived at 80 rue Jouffroy d’Abbans.
. . . a workplace elegantly furnished with comfortably upholstered chairs, Persian rugs, and drapery befitting his new professional standing, and with an upright piano against one wall, . . .
No longer would Sargent’s patrons have to track through the mud and past the questionable bohemians on rue Notre-Dame-des-Champs. 41 boulevard Berthier has been replaced by a newer building, but this one next door is a good example of the types of buildings that once dominated the street, with large windows and skylights on the top floors. It was on this street that Virginie Gautreau would have gone to pose for her portrait. 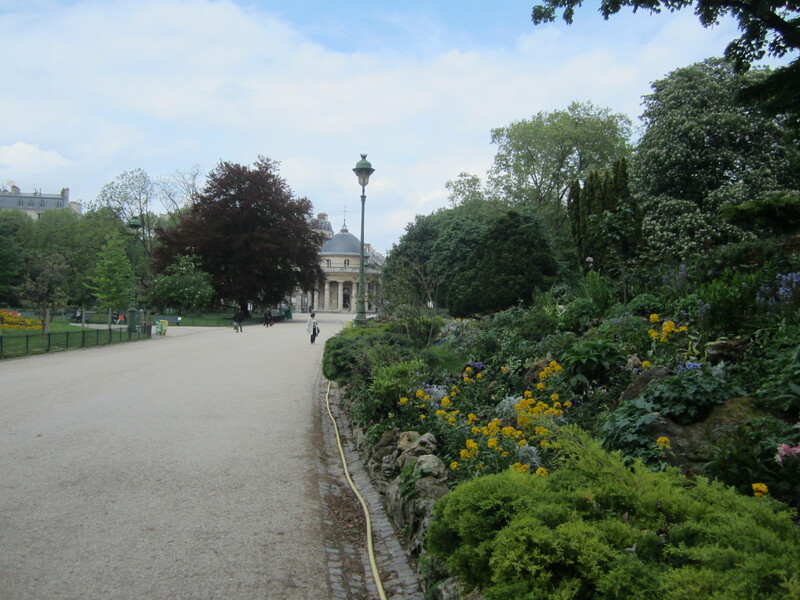 Parc Monceau in the 17th, the center of the fashionable new Plaine Monceau area of the 1870s-80s. Monet painted this park several times. 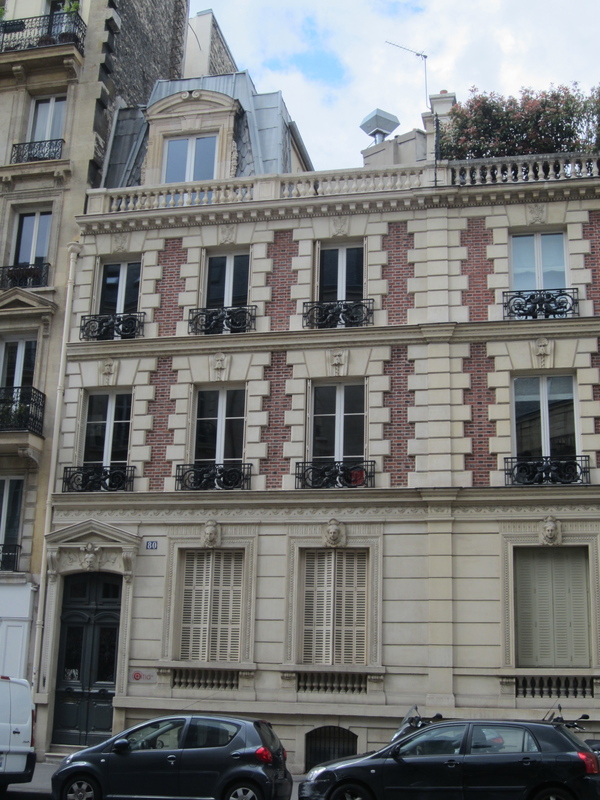 80 rue Jouffroy, the home of Virginie and Pierre Gautreau in the 1880s. 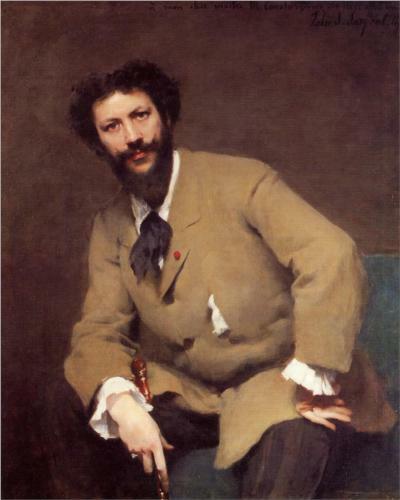 By 1883, Gautreau finally agreed to pose for Sargent. He talked her into wearing a black dress that would highlight her unusual color, which included rouged ears, white pastey skin (thanks to lavender skin cream) and brightly hennaed hair. At the end of the day, Sargent may have painted her color a little too well. He captured her true character, just like he had with Dr. Pozzi. Her pose was so confident it seemed haughty. But the strap was the last straw. The painting we know now, as it appears at the Metropolitan Museum in New York, was retouched. The original painting looked like this – a little risqué, no doubt, but more balanced and much more interesting. Sargent soon left for the summer in London while Gautreau disappeared to Brittany, far from the judgment of Paris. 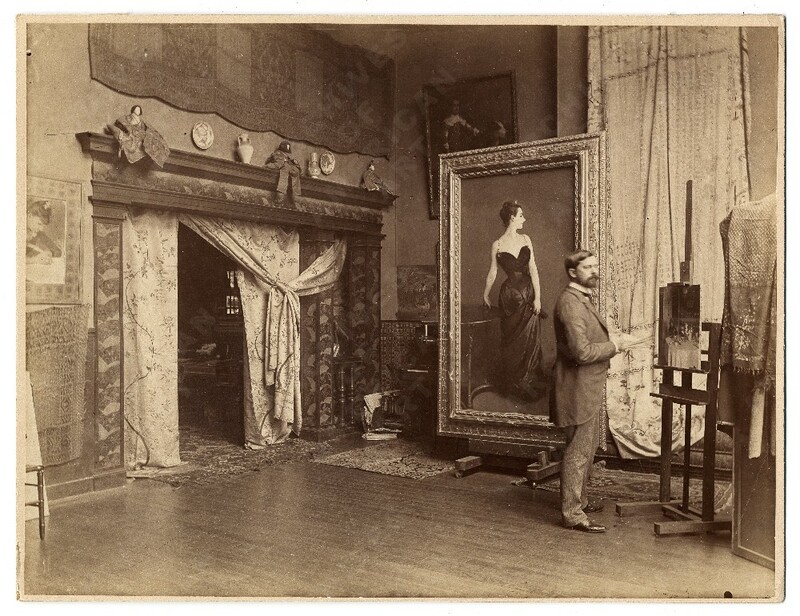 Sargent would keep his Paris studio on boulevard Berthier for two more years, where he proudly displayed Madame X.
John Singer Sargent in his boulevard Berthier studio with a retouched Madame X. The strap is repainted. If your read I am Madame X you will find out much more about Virginie Gautreau: her New Oreans background, her family’s escape to Paris during the Civil War, her early years in a Paris convent school. It’s a well-told story in the voice of a fascinating woman. I am Madame X by Gioia Diliberto: HIghly recommended. 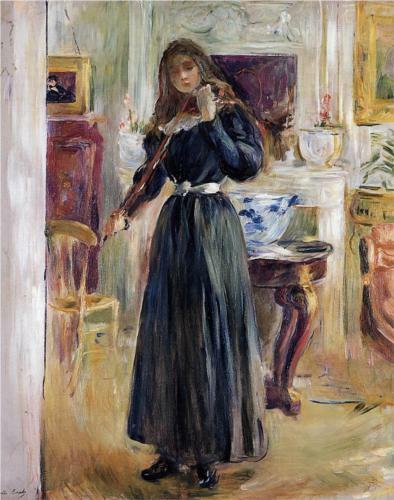 In this 1893 painting, Berthe Morisot pictures her teenage daughter Julie in the interior of their apartment at 10 rue Weber, where they moved after the 1892 death of Morisot’s husband Eugene Manet. I think it tells us a story about the interior of Morisot’s own life. One of the first things I notice is the portrait of Morisot hanging on the wall to the left of the fireplace. Her brother-in-law Édouard Manet painted it in 1873, when Morisot was thirty-two years old and had just started showing with the Impressionists. Manet gave it to Morisot as a gift. I am always struck by the pose and the gaze that Manet captured. Pretty sensuous. Yet one year later, Morisot would marry Édouard’s brother. Twenty years later, after both Édouard and Eugene have died, Morisot paints a picture with this portrait in the background. There are a few other interesting details in the painting of Julie and a Violin. According to Julie Morisot, who is quoted in the Exhibition Catalog for the Berthe Morisot Exhibit at the Musée Marmottan, the painting to the right of the fireplace – which is cut off and barely even depicted – is a painting of her father by Degas. In the center of the painting behind Julie, there is a large Chinese bowl, a treasured gift from Édouard Manet. Notice how close it is to the fireplace, how bright and prominent it is in the center of the room next to Julie. Finally, consider the empty yellow chair facing Morisot’s own portrait. It has been placed there on purpose – why else would it be facing the wall and not Julie? I think we know. The two most treasured people in Morisot’s life were her daughter and Édouard – not Eugene – Manet. But of course, I’m just speculating, drawing wild conclusions from a pretty painting. And yet, I know that everything in the background of a painting is carefully selected and placed there for a reason, just like the details in a book. I think this painting hints at a really good story. 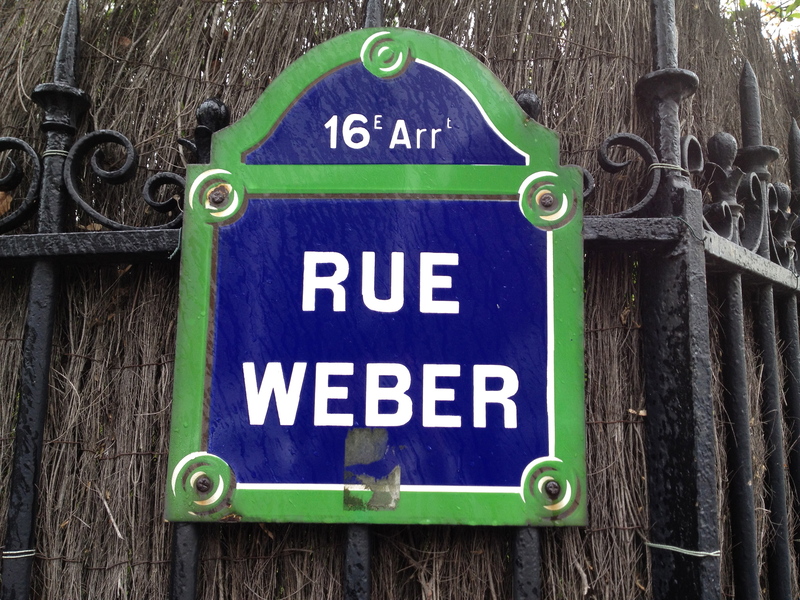 If you go to rue Weber today, you can find Morisot’s lovely apartment still standing. There is no historical marker, and few of the neighbors I spoke to even know it was once Morisot’s home. It is one of the loveliest streets in Paris, in a quiet corner of the 16th arrondissement that ends at the Bois de Boulogne. Despite their loss and grief, Morisot and her daughter must have had some simple pleasures their last two years there together, with frequent walks and sketching opportunities in the nearby park. Morisot would catch pneumonia in 1895 and die at the age of 52. Julie would come under the guardianship of a Manet family friend, the poet Stéphane Mallarmé, until his death in 1899. Morisot’s secret interior would live on in her paintings. You can see many of them for yourself at the special Berthe Morisot Exhibit at the Musée Marmottan until July 1, 2012. I can’t say enough about Rosecrans Baldwin’s new book, Paris, I Love You But You’re Bringing Me Down (Farrar, Strauss & Giroux). This memoir is witty, charming and laugh-out-loud funny (make that snort-out-loud, while I was reading in a Paris restaurant, no less), based on the eighteen months Baldwin and his wife spent in Paris a couple-few years ago. It’s a perfect romantic comedy, like a cross between The Office (Paris Edition) and Midnight in Paris (without the time travel). I’m already doing the casting in my head. Baldwin tells his Paris story with a smart and fresh spin. He worked crazy hours at a Champs Élysée advertising agency, writing copy and making sales pitches to luxury clients like Luis Vuitton, while she attended immersion French language classes, played the part of a femme au foyer and tried to write screenplays in a dark and dismal apartment surrounded on five sides by construction. 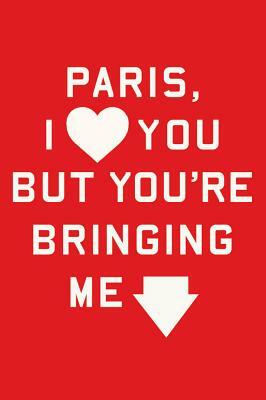 Americans have no simple love affair with Paris. But that revelation isn’t enough to make this book unique. It’s the complexity of Baldwin’s voice: he’s tender, wise, and smitten, but also droll and irreverent. Who knew the French were so darn funny? Baldwin’s tales from the office sound more like the reports of an American mole secretly planted in a Parisian workplace. Baldwin’s primary source is a rough-around-the-edges colleague, a “stocky and morose” Parisian who loves nothing more than his cigarettes and his Yamaha scooter. It’s a point of view most Americans never get to see, a bit like having a disgruntled French Danny De Vito as your tour guide. Either Murphy Brown never aired in France, or Paris was stuck in the early nineties. . . . In meetings, if someone called your idea P.C., pay-say, there was no possible recovery. The label was nuclear. Anyone accused of pay-say during un brainstorming would be shouted down – Don’t be so American! . . .
Baldwin’s inside knowledge leads to surprising discoveries, like the French affection for McDonald’s: a French colleague, confused, “You don’t go to McDonald’s in the United States?” Baldwin can deal the scoop on their Frenchified Mac-attacks (a multi-course meal, starting with McNuggets as an appetizer, a sandwich, then a salad and finally dessert). Who knew? And now that we know, won’t it be a fun fact to remember the next time a stuffy French waiter gives you the stink-eye? So when Baldwin and his wife Rachel had the chance, off they went to Paris. Like all good expats, they felt humbled by their inadequate French, and worked hard to improve it. Nevertheless, their language faux-pas (is there a plural for faux pas?) make for absolutely delightful stories. We’ve all been there, but never quite like this. One time Rachel was picking out some champagne to celebrate the sale of Baldwin’s first novel, un roman in French (You Lost Me There, Riverhead Books 2010). The Frenchman gave her a strange look. He thought she said her husband had sold his first “Roman,” like some kind of Italian slave trader. Yah, that’s right, monsieur, you know us crazy Americans – we always pop the champagne for our first slave trade. Like many Americans, the Baldwins had a love-hate list for Paris (love: walking across the Alexandre III Bridge, food from Picard, men who read in public; hate: long grey winters, the bureaucracy, construction noise, stores that close on Sundays). And inevitably comes the question, “so how long do you want to stay here in Paris?” And no matter how idyllic it can be to take a nap in a field of tulips on a daytrip to Giverny, they realize that they are ready to go home. So obviously, I loved this book. I think you will too, whether you love or hate Paris, or maybe a little of both. You can read an excerpt here.